"Something GOOD is going to happen to you today!" It rang through my ears in the fall of 1978 as I landed in Tulsa Oklahoma to apply at Oral Roberts University. I was enrolled at University of Cincinnati and on a music scholarship but the Lord came into my heart in my college dorm room and my life was about to change. I wanted to be accepted in this university where I could "expect a miracle" and practice what Oral Roberts called seed-faith. 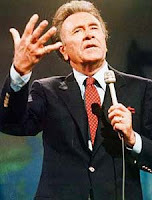 Oral Roberts changed the direction of my life. Though I did not get out of the university all that I could have(because of my own choices), I still believe that it was a catalyst for me to give my heart to Jesus and my life in pursuing His plans and purposes. Today I am a Senior Pastor, a life-coach for others and oversee other ministries that reach into the soul of our community with tangible acts of love. Why? Because a man long ago kept reciting a mantra, "something good is going to happen to you" and I heard it until my faith arose and I actually believed it! And something good did happen to me! The world will miss Oral but I am certain that Evelyn and the rest of the family in heaven are thrilled to have him by their side again. They have gotten everything they expected! Something good has happened and heaven has welcomed a true champion of the faith. God bless you Oral for your life, your words, and your witness to the ends of the earth. This is one life that you touched that will continue to touch others.